Sand, Wind and Stars - LRDG, 70 years on: A rare find. I found this last week on a trip around Georgia last week (former USSR one!) Maybe a pre war style desert trip one day? Bagnold used similar on his pioneering trips between the Wars that have inspired so many of us. I think it’s a Model A Ford truck, but I could be wrong. It had no engine, sadly, but I guess any old engine could be adapted to fit. What's that bleeder next to it? A Renault? The most familiar of these reparations vehicles are BMW motorbike R 71 from 1938 with a sidecar, which I think is still manufactured under the name of Ural. Went with such in Cuba in 1982, a lovely engine sound, I remember ..! 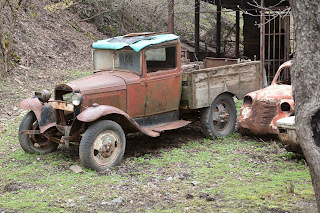 That is a GAZ AA, which is a Russian-built (under license) version of the Ford AA.